Taking it easy today before the beer league hockey finals tonight. I started to search around to see how much some of my old hockey cards are selling for on eBay. I came across this beauty of a card that just makes you say WTF. I can remember all the hype about Raghib "The Rocket" Ismail, but was too young and not much of a CFL fan back then. 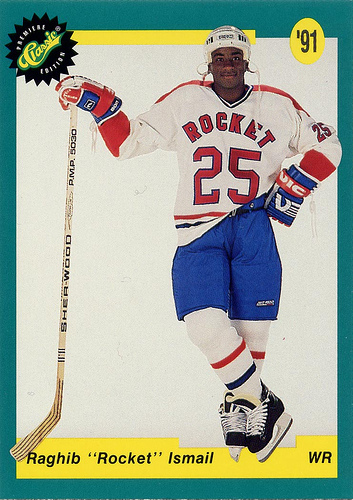 The Rocket was an explosive college football player and projected number one draft pick in the 1991 NFL Draft, but decided to bolt to the CFL for a record 4 year contract of around $4.55M a season. This was the highest yearly contract in both leagues as Toronto Argonauts owners Bruce McNall, John Candy and Wayne Gretzky had the cash to toss around. It payed off with the Argos winning the Grey Cup that year and The Rocket winning the Grey Cup MVP, he also was selected to the All Star Team. The next season the Argos had lost some key players and struggled. After that season the Rocket decided to head to the NFL and play for the Los Angeles Raiders who had his NFL rights. Most recently, The Rocket was seen coaching Slamball in 2008... Seriously. This card is still cooler than Alexandre Daigle dressed as a nurse, and the Rocket was more successful! I have this card too! I have seen that card and still don't know what the hell Daigle was thinking posing for that. If McNall had known he was going to go to jail, who else would he have brought to the Argos and Kings with somebody else's money?